Facing extinction, the Metal-Horned Unicorns of MarBryn are desperate for hope. Any hope. . .So when the Oracle reveals the prophecy promising just that, the remaining members of the tribe pin their future on the birth of a young foal. Hope becomes despair when the baby unicorn is born without metal. . .because without metal there is no magic. And without magic, this little blue newborn has no chance to defeat the evil sorcerer that has imprisoned all of MarBryn. Magh’s rule proves both harsh and brutal and by the time Blue comes of age there are only twelve metal-horns left in all of MarBryn. Eleven can claim some form of metal based magic. . .but one must get by on sheer grit, will, and the desire to avenge his parents untimely deaths. Like most of the metal-horns, Blue disregards the prophecy as nonsense, but driven by his insecurities, he covertly trains for a fight he’s ill-equipped to win.And then hope comes back around. For Blue…For the Metal Horn Unicorns of MarBryn …But can a unicorn with no metal … no magic … answer the call of fate? The Blue Unicorn's Journey To Osm Illustrated book was a feast for the eyes but the story was short. This novel is the expanded version of that story. 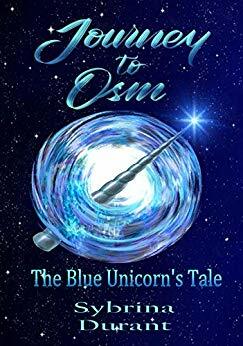 "Journey To Osm - The Blue Unicorn's Tale" by Sybrina Durant only $2.99 on Kindle until Feb 18, 2019!